Although Mike promised an end to the season preview series with his excellent haikus, I’m here to break that promise. Mike’s and Joe’s exhaustive previews touched on everything but the stadium, and while Yankee Stadium in its seventh season isn’t undergoing major changes, there are a few additions — not all welcome — to the House That George Built. So as fans start to line up in a few hours for another season of Yankee baseball in the Bronx, what changes can they expect to see this year? It’s been a long time coming, but 2015 marks a turning point for security at Yankee Stadium. Under pressure from outside security consultants, every MLB fan will be screened as they enter the Stadium, and the screening won’t just involve a cursory glance through the contents of a bag. This year, the Stadium will feature metal detectors and wanding at every entrance. According to an email the Yankees sent out this weekend to their fans, the new screening procedures are part of an effort, in conjunction with the Department of Homeland Security, to “elevate and standardize security practices across the game.” The Yankees are warning fans to arrive early and budget extra time for security, but for many trying to catch first pitch of a 7:05 game after a day in the office, this suggestion ranges from impractical to infeasible. I know plenty of fans who have a tough time arriving for first pitch without added security, and I fear this move will simply push fans to watch more games from one. I know one season ticket holder willing to give up her package if the security lines take too long. The Yankees recognize the challenges, but the early indications are that this screening will lead to long lines. The Barclays Center has struggled to move fans through metal detectors, and even in the Bronx, NYCFC fans faced disorganized and slow screening procedures in March. The utility of this move — which sounds more akin to security theater than actual security — is up for debate as well. Speaking of NYCFC, 2015 marks a milestone in the Steinbrenner family initiative to bring more than just baseball to Yankee Stadium. We’ve seen a few soccer friendlies in the past and some off-season football games, but this year — and until their stadium scenario is clarified — New York City FC and the New York Yankees will be sharing the Stadium. Barbarisi detailed the initiatives in place to guard against field damage. The grounds crew will have a few days to restore the grass following soccer games, and the pitcher’s mound isn’t in the field of play on the soccer pitch. Still, the players recognize that they need to watch the new grass; Brett Gardner speaks to The Journal knowingly about root systems and turf patches. The Front Office though maintains the grass will be fine, but they have much to lose. As those who follow me on Twitter know, I’m a big fan of craft beer (Untappd! 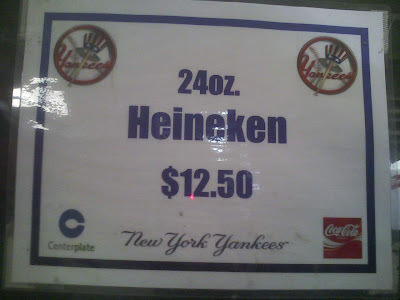 ), but I’m not a big fan of the Yankee Stadium beer situation. While Stone has set up shop in Petco Stadium, Boulevard fills cups in Kauffman Stadiu, and the Mariners are known for their beer selections, due to the demands of the dollar, Yankee Stadium is exclusively the home of InBev-Anheuser Busch products. Thanks to recent acquisitions by InBev, Yankee fans can now find Blue Point beers, and a recent photo from an NYCFC game shows Long Trail available too (though the Vermont brewery is not connected to InBev). It’s a step in the right direction, albeit a small one, and I yearn for the day when we can find a Bronx Brewery beer at the Stadium or even a SingleCut, Finback or Other Half brew. Yesterday morning, we talked about the disappointing beer options at Yankee Stadium. Today, the Trenton Thunder’s P.R. head emailed me with a very timely promotion. Tomorrow night down in Trenton, the team is hosting a $1 domestic beer night in Waterfront Park’s new picnic area. All domestic draft beers in the picnic area will be on sale for $1, and all fans can get to the picnic area. Find out more at the Thunder’s website. Bill Cook, the director of P.R. for the Thunder, also provided me with the beer list, and as stadium brews go, it’s a good one: Sam Adams Brown Lager, Coors Light, Miller Light, Miller MGD, Budweiser, Bud Light, Michelob Ultra, Corona, Corona Light, Yuengling Lager, Yuengling Black and Tan, Heineken, Amstel Light, Stella Artois, Hoegaarden, Bass, Spaten Lager, Spaten Octoberfest, Spaten Franzikaner Hefe Weiss and Sierra Nevada Pale Ale. The parent club could take a lesson. The Stadium Beer: What’s on tap? It’s 9:30 a.m. on the East Coast. Most Yankee fans are only now just getting into work. They’re sliding into their desks, turning on their computers and finding — you guessed it — an article about beer at Yankee Stadium. Is it ever too early for that? The story comes to us via The Times’ Dining In/Dining Out section, a Wednesday specialty. Eric Asimov, a Times reporter paid to drink wine, beer and liquor as his job, journeyed to the city’s new stadium to sample the brewskis available at each. He is not too impressed with what he found at Yankee Stadium, and as a beer connoisseur myself, I don’t blame him. The new Yankee Stadium has a problem. No, it’s not all those home runs, it’s the beer. The stadium pushes the usual mass-market brews, which is to be expected of any big venue. It also has a beers-of-the-world stand that sells brews like Heineken, from the Netherlands; Beck’s, from Germany; and Stella Artois, from Belgium — all from nowheresville, if you ask me. It has a retro-beer stand that sells — give me strength — Pabst Blue Ribbon and Schaefer. If you look really hard, you can find Guinness, which is an acceptable fallback. But with all the great craft beers available nowadays, why aren’t any of them at Yankee Stadium? Citi Field, the new home of the Mets, sells a selection of beers from Brooklyn Brewery. That’s encouraging — and frustrating to a Yankees fan. Look, I don’t even know if I can afford to go to these two fancy new ballparks, much less pay for the beer. I have children about to go to college, and paying $9 for a can of Pabst, even the 16-ounce can at Yankee Stadium, is one of the least enjoyable ways I can think of to blow their college fund. But if I do go to Yankee Stadium, I want some beers worthy of the team. I offer you now my solution to the big beer wasteland in the South Bronx: American pilsners. Asimov’s column goes on to review a mostly innocuous bunch of beer. That is, after all, what makes a pilsner the perfect ballpark beer. Served cold, it’s refreshing on a hot summer day, and unlike other craft-brewed higher alcohol beers, it doesn’t demand too much of the beer-drinker’s attention. Living in Brooklyn, I’m spoiled. I live a few blocks from The Gate, around the corner from Bierkraft and a short subway ride away from Bar Great Harry. It’s not a stretch for me to say that the beer offerings at Yankee Stadium just don’t cut it. So what’s the solution? Like Asimov, I’d urge the Yanks to take a look at Victory’s Prima Pils or the Brooklyn Brewer’s pilsner offerings. Tröegs and Lagunitas have pilsners that American baseball fans should be able to stomach as well. I know Budweiser pays a lot to market itself as the King of Beers, but in a stadium with a steak house, a Hard Rock cafe and sushi, can’t we get a decent beer too? A friend of mine — one of those midwest transplants who move to New York — finally made the trip to Yankee Stadium after a few years spent living in the city. As I was reading his account of the trip, I came across the typical beer rant. Beer is too much at Yankee Stadium, he opines. But the accompanying picture got me thinking: Is beer really that expensive in the Bronx? That’s the sign from the Stadium. A 24-ounce Heineken costs $12.50. That’s expensive, right? Who wants to pay $12.50 for a beer? Well, in reality, you’re paying $12.50 for two beers. A bottle of Heineken contains 12 ounces of beer. So one giant Yankee Stadium beer contains two bottles of beer. I know I’ve been to bars in New York City where bottles of Heikenen can run $5 or $6. Sure, that’s expensive, but that means Yankee Stadium’s $6.25 bottles of beer aren’t that outrageously priced. Walking around the streets of New York, you’d be hard-pressed to find $4.50 hot dogs. You can’t buy Cracker Jacks at Yankee Stadium prices anywhere else, and the peanuts you can find in the city are better and cheaper than the ones they sell at the Stadium. But the beer, well, that’s not that much more expensive than other places that sell Heikenen at marked-up prices.